Babies and toddlers are definitely adorable, but they’re able to get into trouble quicker than you might realize. Naturally curious and always on the move, having a big, open house to explore and play with can end up leading them to some hazardous places or dangerous things that they shouldn’t be exposed to. When we’re planning to have a baby or already have some kids in the house, safety becomes a number one priority. Things that you never gave a second thought to suddenly become dangerous and risky for babies and small children, whether it’s a staircase or a kitchen full of potentially harmful gadgets, you suddenly need to rethink your home’s layout. The simplest way to keep your babies and toddlers safe is with a baby gate and these seemingly basic devices have been doing so for years. A baby gate can be whatever you need it to be with so many different styles on the market and something to suit every type of home. Baby proofing a house is never a fun job, but with a baby gate, you’ll be able to tackle larger parts of the home at once. With some quality baby gates in place, you won’t need to worry about chasing after baby everywhere they go or wondering if they’ve gotten somewhere they shouldn’t be. For peace of mind and absolute safety for your little ones, they’re a must-have device for every parent. How much setup do I want to commit to? What size are my doorways and passages? How hard should entry be? How strong should the gate be? Does it need to match my home? How many gates do I need and where? Baby gates sometimes referred to as child safety gates or barriers, are devices installed within the home to keep the littlest members of the family from going places they shouldn’t be. In any standard home, there are a number of hazards that apply to babies and toddlers, so the installation of one of these gates is a simple fix. A baby gate comes in many different styles and types, with configurations available for every home. You might need a gate that’s extra wide, one that’s tall, one made of fabric, or any other number of specifics, and there’s a good chance you’ll be able to find it. Baby gates can be installed relatively easy and save parents and caregivers the hassle of securing individual things within a room. They also keep them away from major dangers like a flight of stairs or balcony, so their uses are countless. 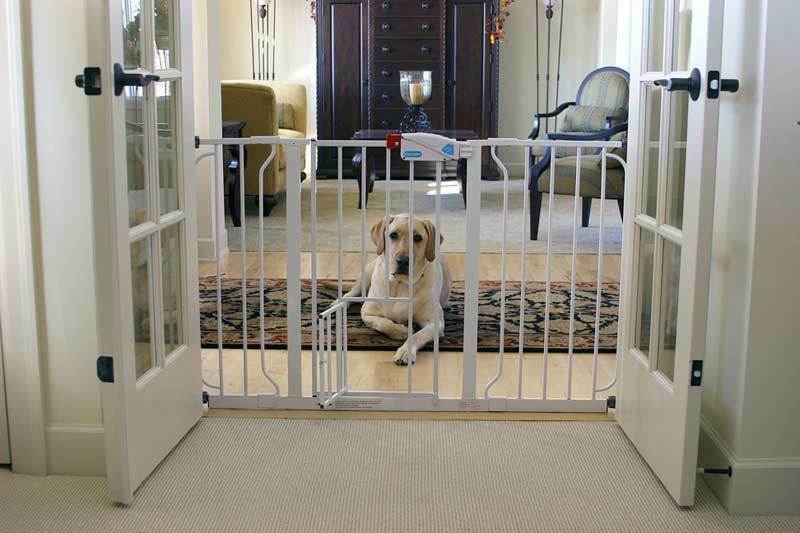 Some homes even use these gates to keep guests out of certain areas or prevent pets from entering rooms, so they’re not just good for kids and babies. Any home that has a baby, toddler or small child, or areas that need to be off-limits to children, will usually feature at least one of these gates. Provided you’re shopping for a quality brand and understand the correct installation and use of baby barriers, they’ll provide you with peace of mind that is absolutely price for any parents. If you’ve already got small children and babies at home, you probably realize why it’s so important to have a baby gate installed. These little humans are naturally curious and like to explore just about anything, but unfortunately, not everything is safe for them to touch or be around. According to a study published in Pediatrics, a medical journal, almost one million children under the age of five were taken to hospital due to stair-related injuries from 1999 to 2008. This averages around 100,000 children a year who are getting seriously injured from a staircase, which is the main area of concern when people are shopping for baby gates. In addition to stairs, there are plenty of other hazards around the home. Just taking a looking in any room of your house will show at least five things to be mindful of, whether it’s something sharp, an object that can fall, chemicals and cleaning agents, an open balcony or window, or a number of drawers and cupboards that pose a threat. Toddlers and babies, although adorable, like to explore their surroundings and their curious nature can often lead to trouble. Installing a baby gate at home, or multiple if you have the need, takes away some of this fear that they could get hurt and prevents certain areas from posing a threat to your children any longer. There has to be a good reason why millions of American families use baby gates in their home, and they might not be as obvious as you think. If you’re on the fence about baby gates and whether they’d be a good fit for your family and household, check out the potential benefits they come with. The most obvious benefit of these gates is the protection they provide. 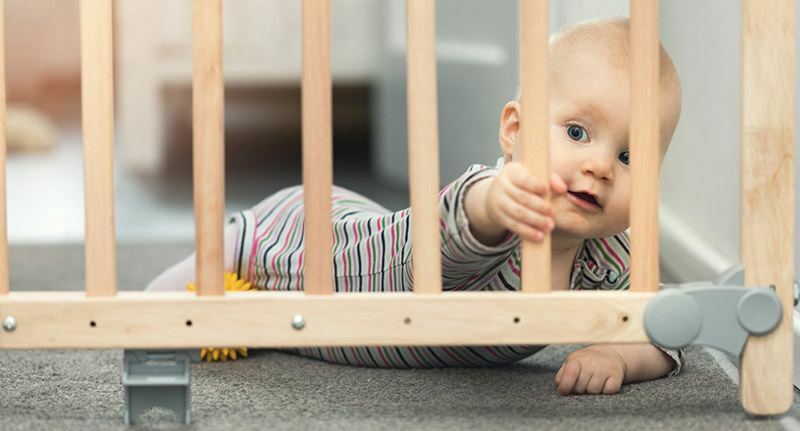 A baby gate can be a safe barrier between your baby or toddler and chemicals, electrical hazards, dangerous household items, and spaces like staircases or balconies. With baby gates installed you can prevent entry to certain areas of the home that might have more of these hazards. 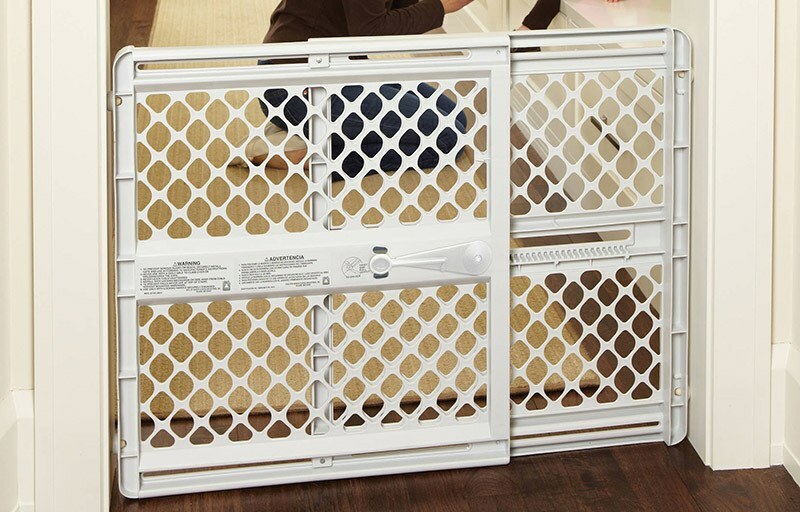 If you have a dog at home that you want to keep out of the bedroom or kitchen, a baby gate is useful. Many people find that even after their children have outgrown the need for a gate, they are still helpful for keeping their dogs and other pets out of rooms they’re not welcome in. Depending on the type of gate you get, these devices can be used around the home for a number of reasons. You might have a portable one or pressure mounted that can be easily installed as you need it. Unless it’s a wall mounted gate, you have the freedom to use them wherever is necessary. 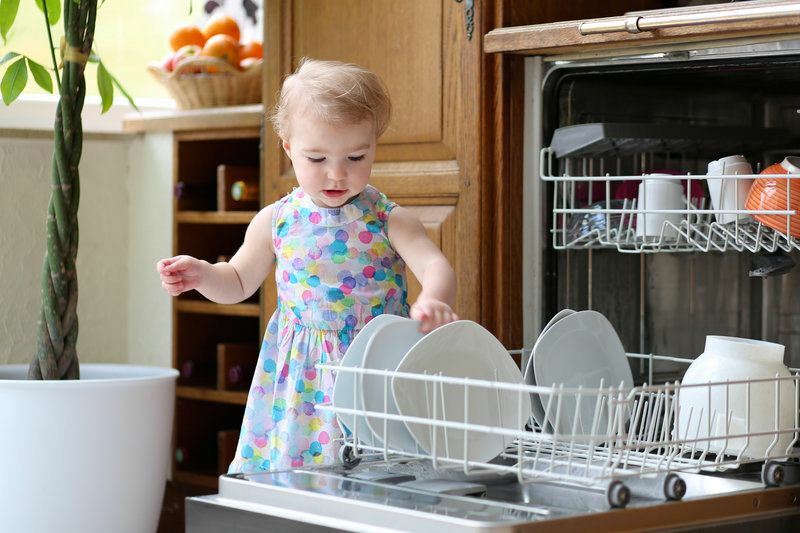 Whether it’s a toddler or a dog, these small creatures have the potential to make a lot of mess in a short matter of time. Having a baby gate installed can keep certain parts of the house clean, or even prevent guests from entering areas of the home that you want to keep them out of. Baby gates are made to be as unique as the homes that use them and there are plenty of configurations that can be used to make them functional. Before you can think about installing a gate, consider the many types of baby gates and what each of them offers to ensure you’re choosing the right one. These are made specifically for outdoor settings so won’t usually feature materials that can rust or become damaged easily. An outdoor baby gate might be used near water, to prevent kids from going in certain areas of the yard or simply to contain them on the outdoor patio. A freestanding baby gate is exactly as the name suggests, providing more of a barrier than a securely locked off area. These are better for babies who don’t have a lot of force or areas that aren’t particularly dangerous. They can be moved as needed around the house but don’t provide as much protection as wall mounted styles. ​These are mounted to the wall but the gate itself is retractable. Made from a softer material and usually, with mesh, they can be pulled to be released and then hooked back up to provide a barrier. People might prefer these if a lower level of security is needed and they don’t like the look of plastic, wooden or metal gates. Pressure mounted devices are installed by applying pressure to the walls on either side. They require little installation and no tools so they’re ideal for homes that don’t have a lot of DIY knowledge. They’re usually sturdy but not considered the most durable of all baby gates. A wall mounted baby gate is installed by first screwing the mounts to the walls and then attaching the gates. This gives added security and prevents the gate from being pushed over. Wall mounted baby gates are recommended for the tops of stairs as they provide extra protection, but they do require more time and know-how for installation. Most baby gates are made to fit a standard doorway, but not every home was designed this way. If you have the need for extra width you might purchase an extra wide device or consider using an extension package that adds some inches to its range. These usually reach up at least five inches higher than standard gates. An extra tall baby gate is ideal for homes with pets who can jump over, or taller toddlers who are already attempting to climb over a standard gate. With all of those options in mind, how can you know which one is going to be the right baby gate for your home? There are some questions you can ask yourself about your house and children that might lead you in the right direction. Pressure mounted gates require minimal setup compared to a wall mounted gate that needs to be screwed onto the wall. Do a measurement of the doorways, entries, and passageways where you want to install a gate. Ensure that the measurements of the product meet them or if an extension kit is required. ​You might prefer a one-handed gate that can be easily opened to save you time. ​Or something more complex that requires two hands to open. ​How strong should the gate be? Not all baby gates have to be heavy duty, so think about the strength you require. Anything going on a staircase or guarding a particularly hazardous room should be serious, but for less important spaces you can probably use a mesh or retractable gate. Gates are made in materials like metal, wood, and plastic, so think about what’s going to suit the décor of your home. Take a look around the home and try to see things through a toddler’s eyes. Any areas where you’d prefer a kid not to be or spaces with obvious hazards, like a top of stairs baby gate or balcony, make a note that you’ll need a barrier there. Baby gates are pretty simple devices to install, even if you choose a wall mounted one. However, there are some things you can do to make the process easier for yourself and ensure you’re putting them in the right place. ​Look for baby gates that have been certified by the Juvenile Product’s Manufacturers Association. These have been safety tested and are recommended for families, so it adds an extra level of trust. ​Don’t attempt to make a baby gate fit where it doesn’t. 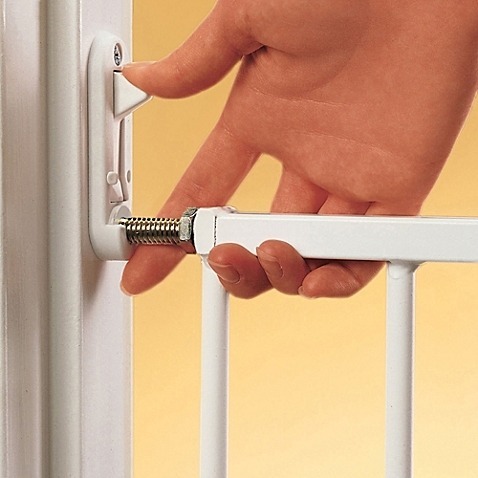 if your baby gate isn’t installed correctly and with use of an extension kit if needed, it won’t get the job done. ​Always choose a wall mounted gate to protect your child from a staircase as it will be better equipped to handle the weight and look for one specifically labeled as a baby gate for stairs. Check the standards put in place by regulatory bodies about how much space should be underneath a gate and between each of the bars. Follow the manufacturer’s guidelines when installing a gate. Avoid working from your own knowledge or doing things without reading the instructions. Most homes have used a baby gate at some point in their child’s life, and although they’re intended to be a safety device it doesn’t always work that way. Unfortunately, the installation of a baby gate doesn’t mean your job is done, and injuries can still occur. According to a report published in 2014 by Academic Pediatrics, the rate of injuries due to baby gates was around 1,794 children per year. The most common injury was due to children falling through a gate and down the stairs after it had been installed incorrectly or left open. Another common injury was due to children climbing on the gate and cutting themselves. Although these devices are designed to keep us, that doesn’t guarantee anything. To ensure that your baby gate isn’t a hazard, you should always have a durable one mounted to the wall at your staircase and always keep it locked. Retractable gates and pressure mounted styles won’t be able to hold the weight of a child as well as a wall mounted device near stairs, so safety should be your first priority. Keep an eye on children at all times and discourage them from climbing on the gate if you see it happening. Sometimes a taller gate can prevent this if you find your child has started to climb. Choose materials that aren’t going to cut or injure your children, shop for a gate that’s best suited to your home’s layout. Each home will have its own needs when it comes to baby gates and what is required in another home might not necessarily be needed in yours. Before you invest in a gate, spend some time looking around the house to pinpoint the important areas where a barrier is required. As well as identifying the hazards around the home, you might also want to install a baby gate for another reason. You could have a gate to keep a pet out, reduce the area that your children can move around in or keep bedrooms and other living spaces clean and without entry. Consider all purposes that a baby gate can be used for before making your final purchase. Stairs pose a major risk for babies and children, especially in their first few years of life. This is the most commonly used part of the home that requires a baby gate and one that anyone with a staircase should be protected with a barrier. 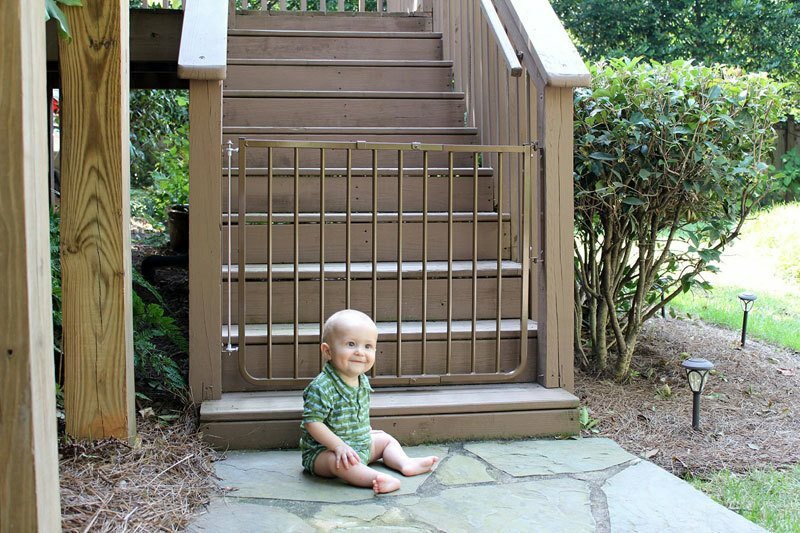 When shopping for a baby gate specifically for stairs, durability and strength are key. You’ll want a wall mounted baby gate that is fastened securely so even if a child were to lean on it, the baby gate would remain intact. The way that it opens is also important, as many kids have suffered injuries from gates that weren’t closed properly. Regardless of the type of baby gate you have and how strong you believe it to be, this doesn’t take the place of parental supervision. Babies and children should never lean on or attempt to climb gates, and they should never be left alone in rooms for long periods of time. When they’re old enough, teaching them to climb down or up the stairs safely will be the best thing you can do. 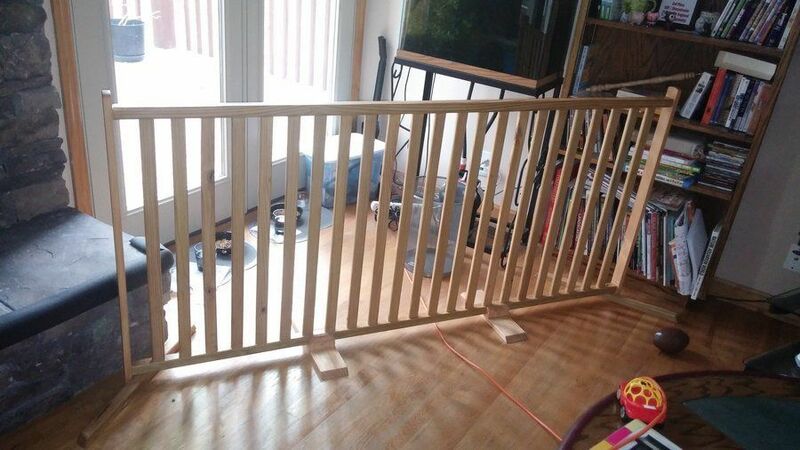 In an attempt to save money, some parents might try to make a DIY baby gate themselves. 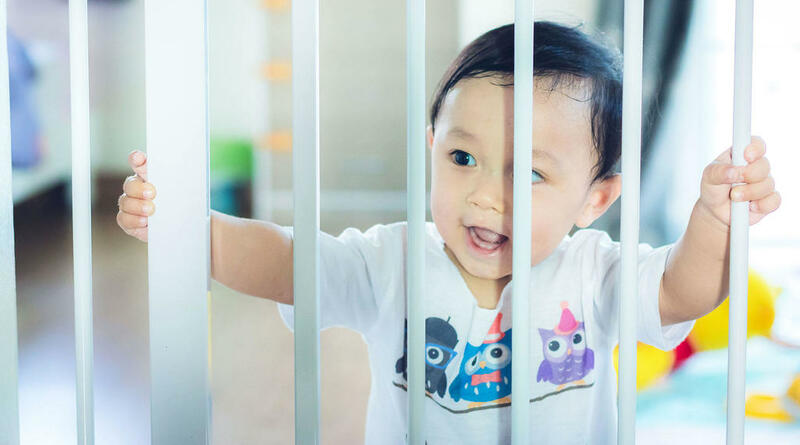 Although the thought can be tempting, and the chance to save some money, they simply can’t offer the protection that a certified baby gate has. There are some tutorials available online for homemade baby gates, but these should only be attempted by people with knowledge in woodwork. Wooden gates and barriers can be mad at home, but they should never replace a baby gate on a staircase or anywhere else where real protection is needed. Even the best designed DIY baby gates won’t have the same locking mechanism or safety standards that a dedicated baby gate features. Therefore, when it comes to safety, the best approach is always to buy one that’s been specifically made with your children’s wellbeing in mind. Babies and toddlers are definitely lovable, but they’re some of the most curious creatures around as well. In just an instant, a baby has the potential to get into a lot of trouble even if things are seemingly harmless in your home. With a baby gate in place, you can take away some of the stress about wondering what they can get up to and whether they’ll be seriously injured. While a baby gate should never be a replacement for adult supervision, they can certainly make your job easier. As an added bonus, they also keep unwanted pets or guests out where they’re not welcome, so they’re not just great for homes with babies and small children around. 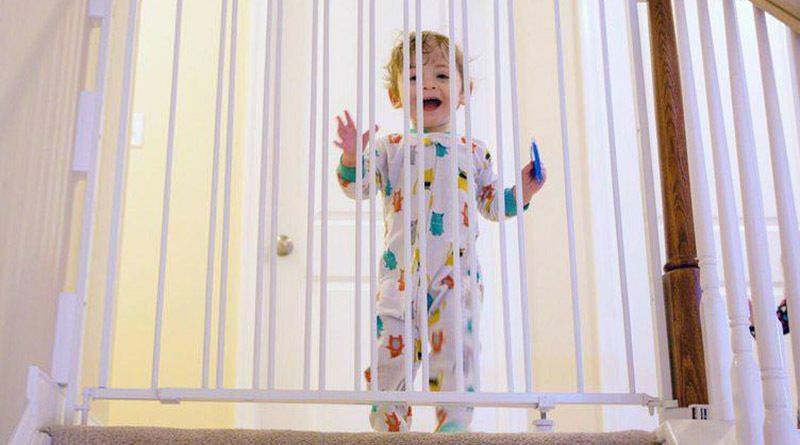 Whether you need specific coverage for a staircase or hazardous area, or simply want to limit the area that your toddler can explore at home, a baby gate is a simple solution. There are many types of baby gates to choose from and there’s bound to be one that’s a perfect fit for your family. With this one simple device installed, you’ll get instant peace of mind that you’re keeping your little ones safe.